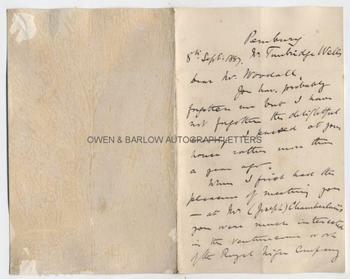 SIR GEORGE TAUBMAN GOLDIE Autograph Letter Signed. British (Manx) explorer, colonial administrator and founder of Nigeria. ALS. 2pp and integral blank leaf. Pembury nr Tunbridge Wells. 8th September 1887. To [William] Woodall. Together with a fine contemporary portrait photograph. "You have probably forgotten me but I have not forgotten the delightful evening I passed at your house rather more than a year ago. 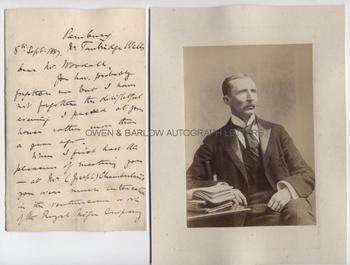 When I first had the pleasure of meeting you - at Mr (Joseph) Chamberlain's - you were much interested in the venturesome work of the Royal Niger Company. You may therefore find a leisure moment - if you have such - to read the enclosed documents which show what has been done up to now. The shorter one - on 'alcohol & civilization' - is the more important one, from my point of view. If you have only time for one I would say read that." 8vo. Approx 7 x 4.5 inches. 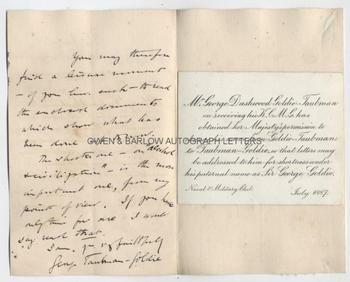 Laid down on the integral blank leaf is the engraved, printed card of Sir George Taubman Goldie, announcing that he has the Queen's permission to change his name. Mounting traces and slight damage to verso of blank leaf, else very good. The photograph of Sir George Goldie is a fine contemporary gelatin silver print photograph, measuring approx 4 x 5.75 inches. It shows him half-length, seated at a table with a stack of books. It is laid down on a card leaf from an album and is in fine condition. Sir George Taubman Goldie travelled widely Africa and, particularly, in the little known regions of the lower and middle Niger. It was he who first conceived of a British company, established by Royal charter to administer British trade and political interests in the region. He concluded over 400 treaties, mainly with African chiefs in the area and successfully resisted the aggressive expansionist policies of both German and France. He established the Royal Niger Company in 1885 and in 1895 became its Governor. 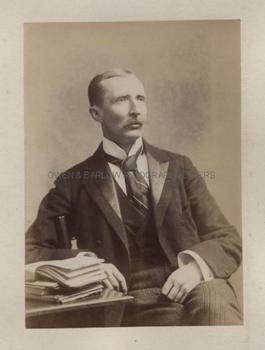 Sir George Taubman Goldie is widely regarded as the founder of modern Nigeria and his role was comparable with that of Cecil Rhodes in Rhodesia.